RIOS1931 Genuine Nytech Watch Band "Advance", 18-24 mm, black, new! RIOS1931 Shell Cordovan Watch Band "Seattle", 18-20 mm, 4 colors, new! RIOS1931 Vintage Leather Watch Band "Chesterfield", 22-24 mm, 6 colors, new! RIOS1931 Genuine Pigskin Watch Band "Havana", 18-22 mm, 3 colors, new! RIOS1931 Genuine Lambskin Watch Band "Merino", 18-20 mm, 5 colors, new! RIOS1931 Shark Style Watch Band "Ocean", 16-20 mm, 8 colors, new! RIOS1931 Alligator Style Watch Band "New Orleans", 16-22 mm, 12 colors, new! RIOS1931 Genuine Pigskin Watch Band "Tobacco", 18-22 mm, 3 colors, new! RIOS1931 Genuine Ballistic Watch Band "Next", 18-22 mm, 2 colors, new! RIOS1931 Buffalo Leather Watch Band "Montana", 18-22 mm, 3 colors, new! RIOS1931 Vintage Leather Watch Band "Oxford", 18-24 mm, 6 colors, new! RIOS1931 Alligator Style Watch Band "Louisiana", 16-22 mm, 13 colors, new! 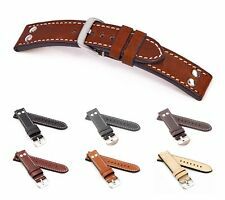 RIOS1931 Buffalo Leather Watch Band "Texas", 16-20 mm, 5 colors, new! RIOS1931 (Germany) Genuine Vintage Leather Watch Band 20 mm Black "Oxford"
Thickness of the strap: Approx. 4,0 mm throughout. Width - 20 mm tapering to 18 mm. RIOS1931 Hydrophobic Leather Watch Band "Deep Sea", 18-22 mm, 3 colors, new! RIOS1931 Shell Cordovan Watch Band "New York", 18-22 mm, 4 colors, new! RIOS1931 Genuine Dynamic Watch Band "Activity", 18-24 mm, black, new! RIOS1931 Ostrich Style Watch Band "Durban", 16-20 mm, 11 colors, new! Rios1931 Genuine Nytech Watch Band "Albatros", 18-22 mm, black, new! RIOS1931 Buffalo Leather Watch Band "Nature", 18-22 mm, 3 colors, new! RIOS1931 Buffalo Leather Watch Band "Typhoon", 20-22 mm, 3 colors, new! RIOS1931 Shark Leather Watch Band "Wave", 18-22 mm, 8 colors, new! Fitted with an 18mm 316L solid stainless steel buckle with brushed satin PVD black plating. Made in Germany from genuine buffalo leather. Piece length 118mm / 82mm excluding buckle. Total length 7-7/8" (200mm) excluding buckle. Leather Watch Strap 20mm x 18mm Black Matte Leather with White Stitching. The band width is 20 mm (lug end) & 18 mm (buckle end). 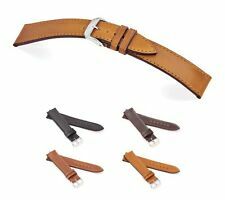 Length: 196 mm Top of the strap is Leather, leather underside. Padded. Gold tone buckle. New. Shows light signs of wear from storing and handling I am not affiliated with any watch manufacturer or distributor. All items sold here are vintage/ pre-owned and being offered for collectible purposes only. RIOS1931 Hydrophobic Leather Watch Band "Dive", 18-22 mm, 3 colors, new! RIOS1931 Shell Cordovan Watch Band "Chicago", 18-22 mm, 4 colors, new! Leather Watch Strap 20mm x 18mm Black Matte Alligator Embossed Leather with White Stitching. The band width is 20 mm (lug end) & 18 mm (buckle end). 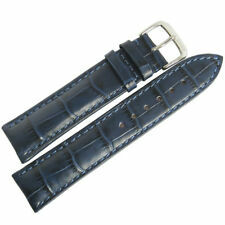 Length: 196 mm Top of the strap is Leather, leather underside. Gold tone buckle. New. I am not affiliated with any watch manufacturer or distributor. All items sold here are vintage/ pre-owned and being offered for collectible purposes only. RIOS1931 Hydrophobic Leather Watch Band "Off Shore", 18-22 mm, 3 colors, new! RIOS1931 Vintage Leather Watch Band "London", 18-24 mm, 6 colors, new! RIOS1931 Genuine Nytech Watch Band "Bass", 18-24 mm, black, new! RIOS1931 Juchten Leather Watch Band "St. Petersburg", 18-22 mm, 6 colors, new! RIOS1931 Juchten Calf Leather Band "Engineer", 19-22 mm, black, new! RIOS1931 Juchten Leather Watch Band "Moscow", 18-22 mm, 6 colors, new! RIOS1931 Buffalo Leather Watch Band "Colorado", 18-22 mm, 3 colors, new! RIOS1931 Alligator Style Watch Band "Vegas", 18-22 mm, black, new! RIOS1931 Rubber Alligator Watch Band "Power", 18-22 mm, black, new! RIOS1931 Genuine Lambskin Watch Band "Cashmere", 18-22 mm, 5 colors, new! RIOS1931 Hydrophobic Leather Watch Band "Scuba", 18-22 mm, 3 colors, new! Made in Germany from genuine buffalo leather. Piece length 118mm / 82mm excluding buckle. Total length 7-7/8" (200mm) excluding buckle. Fitted with an 18mm polished stainless steel buckle. RIOS1931 Juchten Leather Watch Band "Pensa", 18-20 mm, 6 colors, new! Made in Germany from genuine pigskin leather. Piece length 115mm / 80mm excluding buckle. Total length 7-5/8" (195mm) excluding buckle. Fitted with a 16mm polished stainless steel buckle. Made in Germany from genuine pigskin leather. Fitted with an 18mm 316L solid stainless steel buckle with brushed satin PVD black plating. Piece length 115mm / 80mm excluding buckle. Total length 7-5/8" (195mm) excluding buckle. Embossed alligator grain on cow leather. Piece length 115mm / 80mm excluding buckle. Total length 7-5/8" (195mm) excluding buckle. Fitted with a 16mm polished stainless steel buckle. Prefer a gold-tone buckle?. Made in Germany from genuine pigskin leather. Piece length 115mm / 80mm excluding buckle. Total length 7-5/8" (195mm) excluding buckle. Fitted with an 18mm polished stainless steel buckle. RIOS1931 Juchten Leather Watch Band "Samara", 18-20 mm, 6 colors, new! RIOS1931 Rubber Alligator Watch Band "Speed", 18-22 mm, black, new! 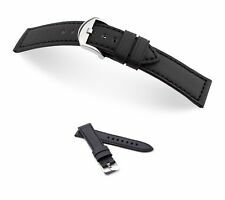 RIOS1931 Genuine Nytech Watch Band "Just", 18-24 mm, black, new! RIOS1931 Alligator Style Watch Band "Hollywood", 18-22 mm, 4 colors, new!